Is there a spacious unfinished basement lurking below your home, while your family lives upstairs in cramped quarters? Don’t let the current appearance of that dark, damp dungeon below your floors prevent you from gaining the space you need to enjoy your home to the fullest. Finishing the basement is one home improvement project that offers a great return on investment – about 70 percent, according to Remodeling Magazine. Finishing the space you already have typically costs less than adding on to your home, as per square foot construction costs are around 10 to 15 percent lower for remodeling a basement versus building a room addition. Whether you’ll be hiring a general contractor to tackle the renovation of your basement, or you’ll be going the DIY route, you will need to consider if your current heating and air conditioning systems can accommodate the additional space and how to keep their components accessible when developing a floorplan. 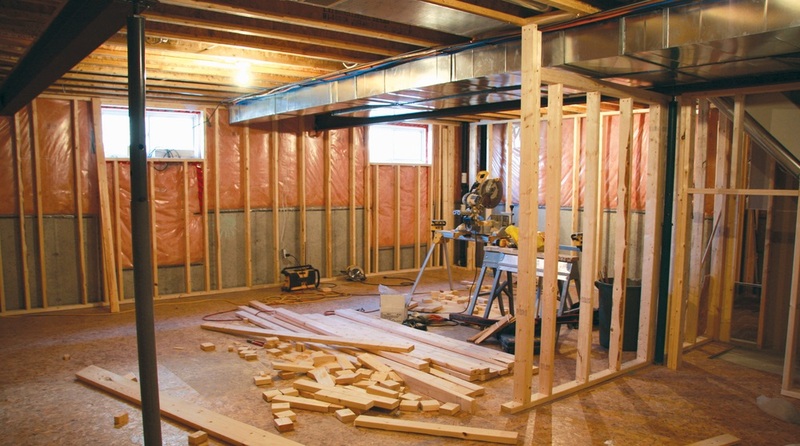 Unfinished basements typically house furnaces, air handlers, and other HVAC components. When designing a floorplan for your finished basement, you’ll want to develop a way to enclose your appliances for aesthetic and functional reasons, without closing them off entirely. Many finished basements incorporate a utility or mechanical room to conceal this equipment from the new living areas. Because you will be creating a confined space which houses a gas furnace and possibly other gas appliances, the enclosure must be properly ventilated per gas code requirements. The amount of cubic feet needed to properly vent your furnace will depend on the BTU output of the appliance, as defined in the National Fuel Gas Code. Your local building codes may also dictate your furnace and other heating and air conditioning system components be accessible for future inspection, repair, or replacement. 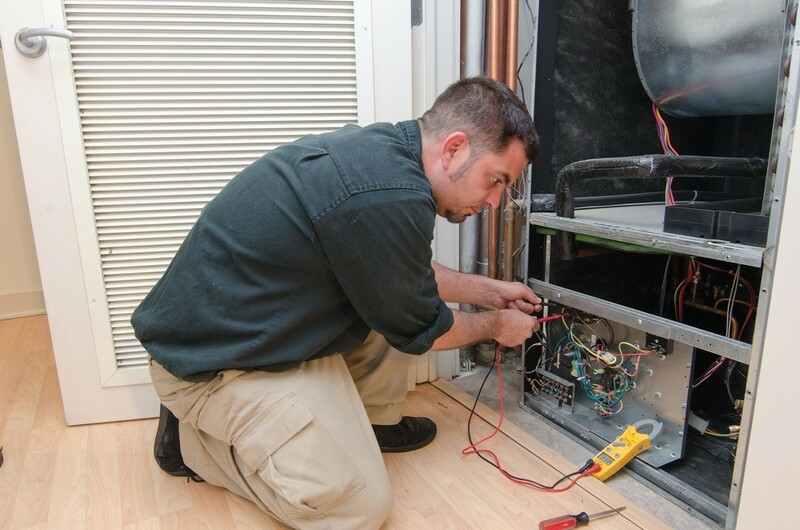 Not only is this a possible requirement, it’s an all-around good idea – protect yourself in the event of future problems by planning a mechanical room which offers adequate space for a technician to work around the equipment, as well as openings large enough to remove your old furnace and install a new heating system. While local building codes vary, the codes which apply to finishing your basement as a living area likely have some heating and cooling considerations, especially when gas furnaces are involved, as mentioned above. If basement windows are not available or existing windows are not adequate for providing the required amount of natural ventilation, you may be required to install a mechanical ventilation system for the health and safety of occupants. Unfinished basements typically are not conditioned, which means no ductwork would be ran to basement areas supplying heating or cooling. Your building office may require detailed drawings which show where existing equipment, supply, and return ducts are located as well as where new duct runs, registers, and other duct system components will be installed. Your municipality may also require you to obtain a building permit when expanding your existing heating and air conditioning duct system or installing a new furnace, heat pump, or air conditioner. A skilled heating and air conditioning contractor will help you determine the size heating and cooling system which is needed to condition your home plus the additional finished basement space, or just the basement space if you’ll be adding supplemental HVAC equipment. They’ll perform a Manual J load calculation to determine the BTUs needed to heat and cool the space. Will Your Old Heating and Air Conditioning Systems Work Properly? When finishing the basement, you’ll be adding several hundred square feet to your living areas, adding that much more space for your heating and air conditioning systems to heat and cool. You’ll need to determine if your current systems can handle the additional demand, or if you’ll require additional capacity; if so, do you upgrade your existing systems or add supplemental systems to accommodate the new space? Heating and cooling equipment is sized in tons – as in BTUs, not pounds. To determine the size of your existing heating and air conditioning equipment, in many cases, you can look to the system’s model number. There are 12,000 BTUs per ton. A model with ‘024’ or ‘24’in the number is a 2-ton unit, as 24,000 BTU/12,000 BTU = 2 tons. ‘030’ or ‘30’ equals 2.5 tons, ‘036’ or ‘36’ equals 3 tons, and so on. If your home’s existing heating and air conditioning systems aren’t the capacity needed to condition the added space of your finished basement, you have two options: upgrade your existing heating and cooling system to a larger capacity system, or add a second heating and cooling system which will condition the space of the basement only. Which is the better choice really depends on your situation and preferences. If your current heating and air conditioning systems are relatively new, you may not wish to upgrade at this time. If you’re experiencing the need for frequent air conditioner repairs or furnace breakdowns, upgrading to a higher capacity system with improved efficiency and performance may make the most financial sense. Should you extend your current system or upgrade to new forced air equipment, you’ll still need to run ductwork to your basement living areas. Adding a second furnace or air conditioner to serve just the basement will also come with the cost of running additional duct work, though space may not be available to house an entire second duct system and HVAC components in your mechanical room. Ductless mini-split systems are a preferred option for heating and cooling finished basements. These heat pump systems do not require ducts to be ran, cutting costs and conserving space. Their indoor air handling units can be strategically placed where space allows, and multiple indoor units can be connected to a single exterior condenser. Basements are notorious for moisture issues. When finishing your belowground space, it’s important that you protect your hard work and the health of your family by installing moisture control solutions. Simply installing a dehumidifier isn’t the solution – on its own, a dehumidifier could actually cause moisture problems in a finished basement, pulling moisture through basement walls. As you finish your basement, be sure to incorporate proper drainage and waterproofing measures to keep moisture out of your underground living areas while also preventing mold growth. Work with a heating and cooling professional to find a dehumidifier that is appropriate for treating your basement area. Basement bathrooms and kitchen spaces should be equipped with exhaust fans to expel excess moisture. Finishing your basement can give your family the increased square footage needed to enjoy certain activities and relax… but no one will be relaxing comfortably in your basement if your heating and air conditioning systems were overlooked during the remodeling process. HVAC.com connects homeowners like you to heating and cooling contractors in your area who will provide the expert guidance and quality services you need when tackling your basement finishing project. Get started today at HVAC.com.